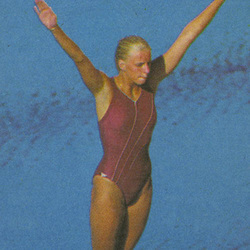 Daphne came to Miami from her native country, The Netherlands, after making a splash at the 1984 Los Angeles Olympics and winning the Bronze medal at theEuropean Championships in 1983. She was named the 1987 and 1988 National Independent Conference Outstanding Female Diver. Daphne finished in the top 4 seven times in her 4 years competing at the NCAA's in the 1 meter and 3 meter events. She was named an All American 8 times, gaining the honor all four years at Miami in both the 1 meter and 3 meter springboards. She competed in the 3-meter springboard at the Olympics in 1984 (Los Angeles), 1988 (Seoul) and 1992 (Barcelona). In Seoul, she led the competition half way through, before falling to 8th place, her highest finish in the Olympics. In 1987 she beat out the entire Eastern block to win the European Championships on the 3 meter board. She won the bronze medal in the 1991 Goodwill Games on the 1 meter and she placed in the Top 5 at the World Championships in both 1986 and 1991. Her brother, Edwin, was also a UM diver. Daphne earned a Bachelors of Business Administration degree (BBA '88) and now lives in Atlanta with her husband and two children; she runs a marketing company that helps entrepreneurs, small business and service professionals gain more visibility and clients, both online and offline.